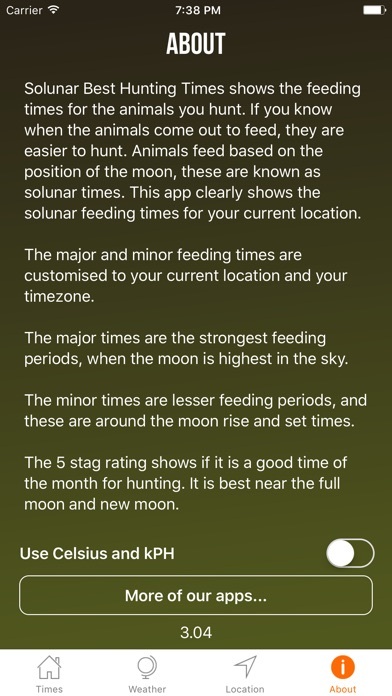 See the best hunting times for where you are hunting now - or any location - on a large, simple, easy to read display. See the best hunting times for any future day. See the current moon phase and sunrise and sunset times. 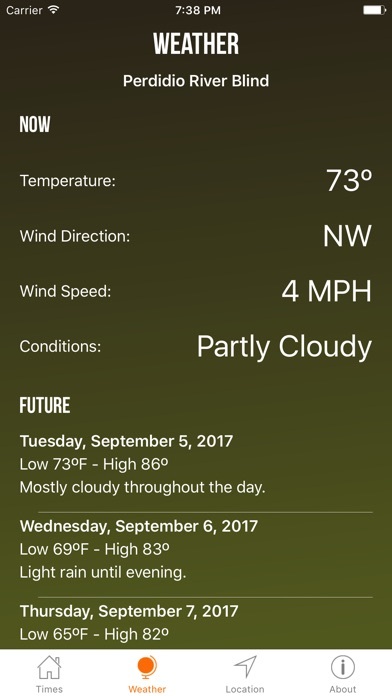 See the weather for your location. No confusing diagrams. Simple and easy. This is the app you are looking for. 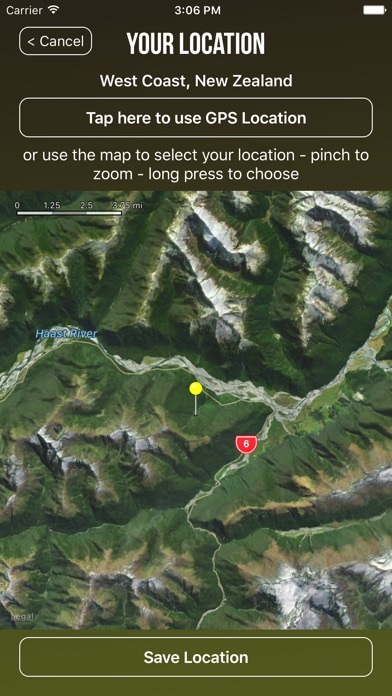 This app shows when animals come out to feed for your location. If you know when animals come out to feed, they are easier to hunt and will make you a more successful hunter. 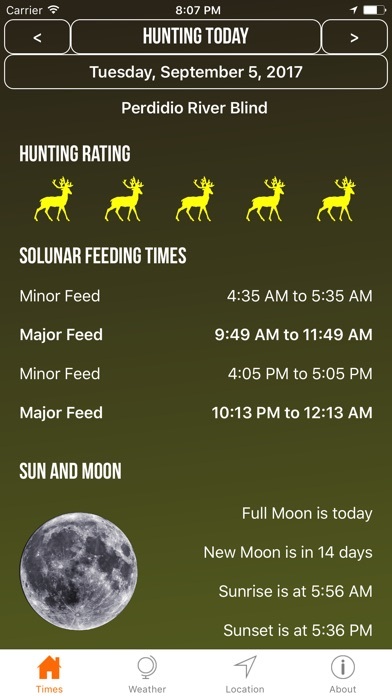 It shows: • Major and Minor animal feeding times • See feeding times for future days • Sunrise and Sunset times each day • Save your favorite hunting locations so you can quickly recheck times • GPS location automatically or manual location selection • Weather conditions and Forecast for right now and the next 7 days, where available • Moon Phase, number of days until next full and new moon • Any date and location • Hunting Rating today - 1 to 5 stags • Graphical moon simulator • Apple Watch supported • Easy swiping between screens An indispensable tool for planning every hunting outing. Thanks for your great ratings, reviews and feedback. If you do have feedback, please do let me know at my website. I read every message. This app is in perfect alignment with what I'm seeing on my cameras!! Very nice! The no moon days with five deer are on the money with mid day buck behavior! If I create a custom location in another time zone, the app does not recognize this and reports the sunset, sunrise and major/ minor feeding times in the time zone where I am presently located. This makes planning a trip to another time zone unnecessarily challenging and also seems to break the hunting rating, as it depends upon these data points. I have reported this problem to the developer via his website and have not heard back. I’ve been looking for a reliable sunset and sunrise app. 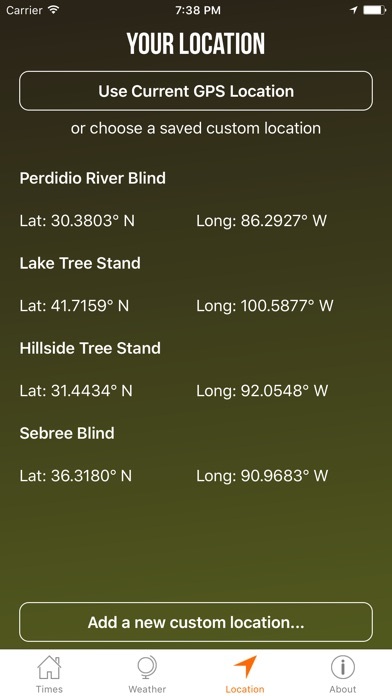 This is a jewel - it not only has sunset and sunrise times but also a simple to use solunar tables app and weather. And - its easy to put in all of my hunting locations and see future solunar activity and weather. Best of all - the Apple Watch support is perfect. This is just the app I was looking for and well worth the price. I looked through A LOT of hunt time apps for Apple Watch support. This is the best one by far. If I remember right, it was the ONLY one that actually has the hunt times on the watch. I don't hunt where I live, I need to save a location. Map will not load, this app is a piece of junk. No frills. Just good solid info. Feed patterns are consistent with the times listed in the app. Killed a nice 8 point the first day I used it. Of course there's more to the hunt than just the feed times, but this app gives you the best chance for success. I was originally concerned with how it would do in the Deep South of the US, as deer down this way tend to be harder to pattern than other places, but it has been spot on every time. Thanks for a great app guys. Keep it up.